In the conduct of such an important celebration, like a wedding, there are no trifles. And choosing the right location, which will host the main part of the holiday congratulations the young are generally one of the paramount wedding problems. Today's wedding is very rarely celebrated outdoors or at home, even if the number of invited guests small. Usually wedding Banquet to order in the restaurant or the Banquet halls that offer its visitors and the space for dancing, and a relaxation room, and a dining area. But before you make your choice in favor of one or another of the hall, the organizers of the event, and the newlyweds must consider several important points. 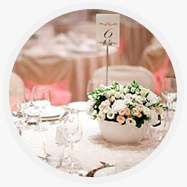 Different restaurant and Banquet halls can offer different number of seats for guests. But the problem is not even how many chairs will be placed in the hall, as in how freely with the movement of the guests. After all, everyone invited to the wedding should not just be able to sit on a table with other guests, but be placed in such a way that he was as comfortable as possible. So the more guests you plan to the wedding, the bigger the room you have to look for organizers. the Next thing you should pay attention while choosing a Banquet hall, this is how long and how hard you will have to get to him. Despite the fact that the road to the venue of the celebration need to organize in any case, very often the geographical location of the hall becomes one of the main arguments in favor of a restaurant. Regardless of the time of year, invited guests and the newlyweds need a room for changing and rest. Particularly important is the presence of the wardrobe in the cold season. However, even in summer bad weather can make us wear a piece of clothing, which will only interfere with the celebration. additionally, a relaxing area will appreciate the smokers as in the main Banquet hall most often are non-Smoking. many one of the cornerstones in the conduct of their wedding put its color scheme. For the sake of someone is enough to make the bridesmaids wear dresses of the same color range, and someone needs to bandage on napkins in harmony with the color of the roses and tie of the groom. So be sure to find out the interior of the Banquet hall, the features of its design and the possibility of changes. And, of course, it is necessary to know the quality located in the hall of furniture. it Should also pay attention to the dishes in which guests will be offered dishes. It's not only in the design and as placed on the table plates and glasses, but in their value as eventual loss of the restaurant among the vessels in case of damage will be compensated, as a rule, the customer of the event. However, for brides that are important to all combinations in design and interior spaces, the design of the glassware itself is also important. If the General decorations can be quite specific, the floor area is small and the location is far, then here's the kitchen simply must be good and suitable for most guests. However, the best option is the one, when taken into account the gastronomic wishes of everyone invited. So, when the invitation to the wedding of Muslims, it is necessary to include in the menu meat dishes that have no pork. For vegetarians should be a choice for fish dishes and salads. In addition, all food should be balanced in spices, and these dishes are quite unusual, so they couldn't just replicate in everyday life. Therefore, it's always better when the organizers try dishes from the menu in advance and know the features of a chef that will prepare for the wedding. But the wedding could be considered good, its not enough to just be beautifully decorated dinner. This holiday is not only for honeymooners but also for guests who always want competitions and dance program. In addition, any wedding is sure to create the atmosphere you want background music. And, of course, what is a good Banquet hall provided a place to put the control Desk, and a platform for performances wedding musicians cover bands or jazz bands, and the necessary space for dancing. since today, most weddings are accompanied by fireworks, which starts at the end of the celebration on the street, then definitely you must have free space in front of the restaurant building.